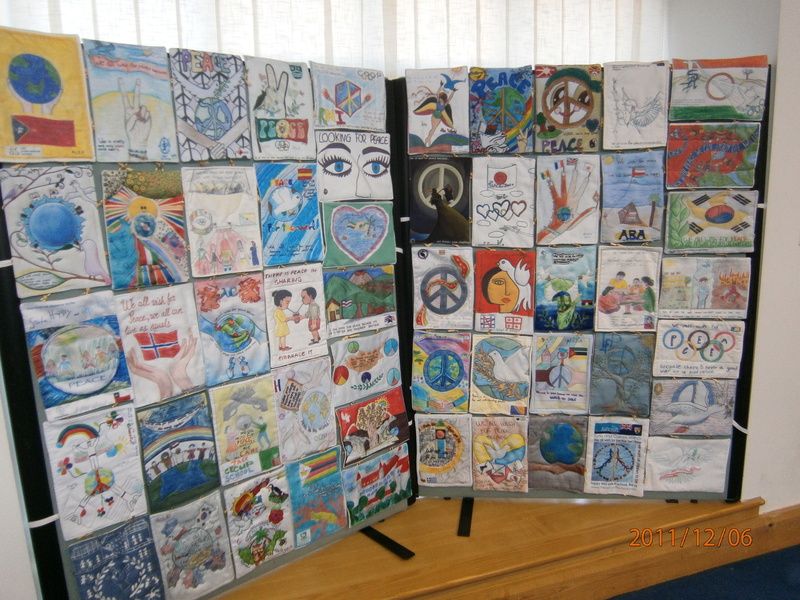 The Schools’ International Peace Quilt Project was created as a celebration of the London Olympics in 2012. From humble beginnings schools were invited from all over the world to participate. The idea was that one school from all Olympic participating countries would submit an A4 size drawing of what Peace meant to children and young people. Once the designs were received, they were then transferred onto material and all joined together to form a Schools’ International Quilt of world unity. This work took place via the wonderful quilters of Guisborough, UK and the Abraham Moss Community School in Manchester, the school representing the United Kingdom. With the International School of Copenhagen, Denmark being the first school to accept our invitation, the Summit College of South Africa number 50 and St. Anne’s Paraguay no. 100, the project went on to include 203 countries of the world. An amazing achievement! The first design arrived from Brunei a country known as the ‘abode of peace’. What a lovely message of peace and harmonious collaboration this project turned out to be. With half the quilt completed by September 2011, it then found its way to Switzerland to be exhibited at the One Young World Summit held in Switzerland that month. The quilt was displayed nationally all through 2012 eventually finding its way to the Stone Space Gallery in Leytonstone London, right next to the Olympic stadium. The Quilt brought tears to many as the profound message for peace from children was felt in the hearts of all. Many creative designs were received, Afghanistan was very moving as was Slovenia; New Zealand was an artistic gem and the impossibility of having young people of North Korea represented actually became possible. The quilt received awards and became a part of the long forgotten Olympic Truce and has since been displayed in many schools across the world. For RIO 2016 we again invited schools, teachers and their students to once more express their message of peace to the world. In a time when Universal Peace has never been so important, the new 2016 Peace Quilt, the Sharnbrook Upper School (UK) Peace Patch UK 2016 project and our new ‘Stride for Truce’ event helped to further promote the OLYMPIC TRUCE which dates back to the original games in the 9th Century BC. For TOKYO 2020 we are inviting schools once more to participate in the “Omotenashi” Schools Project. For students to research the word Omotenashi and then to create their understanding in art form. We are now accepting work for this project. Please send submissions to internationalpeacequilt@gmail.com. 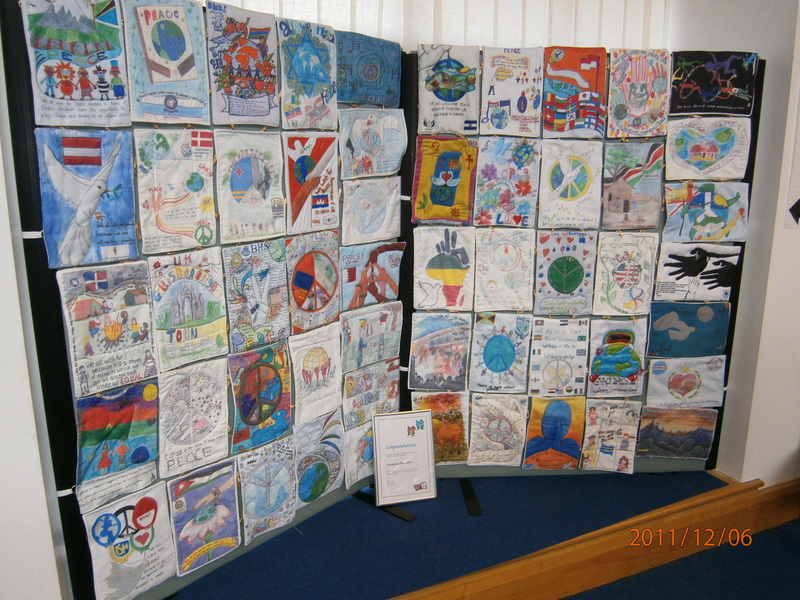 The 2012 Schools’ International Peace Quilt project will forever live on as a lasting legacy in the form of the colourful ‘Children’s Book of Peace’ in which all the drawings have been published with added information. A massive thank you to so many teachers and their wonderful students for being an amazing part of this creative project, without you all this simple but ambitious idea would never have formed from an acorn into an oak! We believe Peace is possible, do you? Copyright©2019 Schools’ International Peace Quilt, All rights reserved. So please let us know if we can help in any way via my personal email as our website is in the midst of a revamp, so wouldn’t want it to go awry. And you can find us on Facebook by searching Trust Sulha Fundraising Organisation as we don’t seem to be able to link from www/facebook.com/TrustSulha yet! Technicalities! If you are able to contact and involve a school from Pakistan that will be very helpful. We will look at your website and see if we can involve you in some way. From the U.S. we have The Bosque School from Albuquerque, New Mexico, participating. Maybe your students have contacts with family or friends in schools from countries that we may not have included yet. Any help no matter what it might be, is very much appreciated. Also your idea of having a picture of the completed quilt in your Pages for Peace book is something we would love to have happen. We intend to have the Quilt finished by September 1st 2011,so it can go on display in Switzerland at the One Young World Summit for young people. This will be on it`s way to being displayed at the Olympics in 2012. The quilt has been invited to take it`s place at the One Young World summit in Switzerland on September 1st, 2011,so we aim to have all drawings in by March 31st 2011,and continue to quilt each piece. As we have already received some drawings, some will have been finished by that stage. Then the year after it will go on display at the Olympics, 2012. I read about your plans for the Peace Quilt. I understand you have a school from the United States who will be presenting a drawing about Peace. Are you accepting more than one drawing from each country and choosing the best drawing? Our school is located in the United States (the state of Arizona) and we would like to participate. We understand the drawing of Peace must be completed by March 31, 2011. Dear Barbara, I have been trying to send you an email around this, but it will not send,Do you have another email address I can use? we would like to ask you, wether you like to have a drawing only? and wether you intend to transform these drawings later into a quilt – which is originally a textil technique with sawing and many stiches with coloured threads? It will be so great to have Leichenstein on the quilt,Thank you. Yes we only wish you to scan the drawing and send to Lucy or myself. Then we will quilt your drawing in the U.K.with coloured threads etc. Also to let you know that the project has now received recognition as Part of The London 2012 Inspire Program,which is really great news too. I love people who inspire students and other teachers. Well done! We in St. Lucia, at The International School of St. Lucia, had an assembly yesterday and both presented our completed peace quilt which has come out of being part of the Olypic Peace Quilt project, and had a Skype conference call with Jeremy Gilley and the whole school about “Peace One Day”. In the photos attached are: the students asking Jeremy questions,, Jermey up on the screen, and the mother, Mrs. Unruh, who sewed the quilt together and my self in-front of our ISSL peace quilt. My daughter’s school entered her artwork for the Peace Quilt. Is there a website that I can see it when it is quilted? Hi Linda, Yes your daughter did a wonderful drawing. Once the Quilt is complete and first chance we have to get a drawing of it all together, we will send this picture to ALL schools involved. It will also have a page on this site when done. The hope and belief is with every single Country included.